Arizona receiver Austin Hill missed the entire regular season with a torn ACL. TUCSON, Ariz. — How does a player handle the difficulties of going from being one of the best in the college game to having to re-establish himself again after missing an entire season? Arizona wide receiver Austin Hill is finding out, and so far, it’s involved a lot of self-motivation and spending as much extra time as possible with his quarterback. He’s been both for most of the fall after suffering an ACL injury to his left knee in the spring game that kept him out all season. "He didnât just sit by. Heâs kind of a student of the game, understands football anyway," Arizona coach Rich Rodriguez said. âI know this: I expect him to have a huge year next year." He may have lost a year — his junior year — but he hasn’t lost touch of what needs to be done. He was in every meeting and weight room session. He’s stronger and bigger. And, yes, hungrier. Over the weekend, Hill and wide receivers coach Tony Dews had a discussion of the future. "I told him to remember the feeling you had when it (can) so quickly go away," Dews said. "This is your last go at it. So every time you come to practice, you have to have a smile on your face and be excited to be out here. It’s made him miss the game instead of taking it for granted." What all the extra work in fall made Hill realize was "how weak I really was," Dews recalled of the conversation. Rodriguez said Hill is essentially ready, but whether he plays or not is up to Hill and the doctors/trainers. 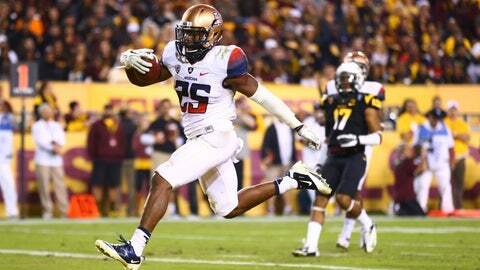 Arizona star Ka’Deem Carey repeats as consensus All-American. âI donât know if, at this point, if he’s going to play in the last game or not, but I sure think heâs on the track to being 100 percent," Rodriguez said. One thing is certain: Hill isn’t allergic to work. He’s doing everything he can to return to the form he displayed as a sophomore, when he caught 81 passes for more than 1,300 yards and 11 touchdowns. He was a Biletnikoff Award semifinalist and a Pac-12 second-team honoree. "Now, it’s about getting comfortable learning the game (again)," Hill said. Not that he ever stopped learning. Even after the injury, at no point did he shut down mentally — and that’s "a lot of the game, mental. I know I have to get better, and I’m doing that." As for whether he’ll be better enough to to play against Boston College in the AdvoCare V100 Bowl on Dec. 31, it’s still up in the air, but Hill said he doesn’t feel 100 percent just yet. "It’s possible, but I’m not going to say for sure that I’m not," he said. "I’m been feeling pretty well and been going through practices. There have been no setbacks with my knee. Things are looking good right now." Still, there is the minor issue of getting hit, which he has done but not with tackling involved. "It’s been a controlled environment in the hitting," he said. "It’s been a progression, and I’m in the final stages of my injury." While it seems unlikely that he’ll be on the field in a couple of weeks in Shreveport, La., it’s a certainty he’ll be returning next season; he said so last month after being cleared to practice with the team. And he repeated it recently, adding "I know where I stand. I have to get my confidence back and try to become the same dynamic player I was. It’s what I have to do and prove." With Hill’s return, the receiving corps at Arizona will be as stocked with talent as any in recent memory. This year’s freshmen — Nate Phillips, Samajie Grant and Trey Griffey — all made significant strides, and veterans David Richards and Daric Wharton improved. And joining them next year will be Texas transfer Caleb Jones and Notre Dame transfer (and former Scottsdale Chaparral star) DaVonte’ Neal. "The receiver group played well, but we did have our ups and downs, as we always will," Hill said. "Trey Griffey did well — once he got a little taste he wanted it a little more. I’m proud of him and all of them. "There was never a real set lineup, and that’s a challenge. And now that I’m coming in, I’ll lighten up the mood and do what I do, trying to help."